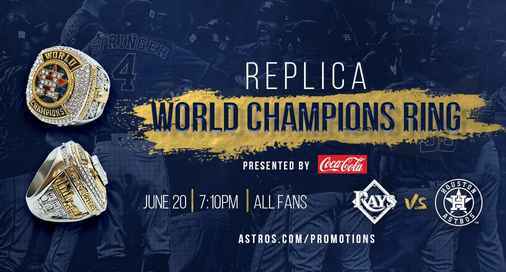 Houston Astros has teaming up with Coca Cola to brings you the Houston Astros Replica Ring Giveaway 2018 at www.Astros.com/Promotions where they are giving the chance to ALL fans in attendance the replica ring on June 20 against the Rays not only this there are many exciting prizes. June 27 vs. Blue Jays: Fans in attendance can stay for a screening of The Sandlot that begins 20 minutes post-game. July 6 vs. White Sox: First 10,000 fans receive a pair of Astros socks. July 7 vs. White Sox: First 10,000 fans receive an Astros gym bag. July 8 vs. White Sox: First 7,500 fans ages 12 and under receive a Jose Altuve youth replica jersey. July 14 vs. Detroit: First 10,000 fans receive a Justin Verlander “K Counter” bobblehead. July 28 vs. Texas: First 10,000 fans receive a Lone Star Series t-shirt. Aug. 9 vs. Seattle: First 10,000 fans receive a TOPPS National Baseball Card Pack. Aug. 10 vs. Seattle: First 10,000 fans receive a George Springer replica rainbow jersey. Aug. 11 vs. Seattle: First 10,000 fans receive a Carlos Beltran 2004 Playoff Bobblehead. Sept. 1 vs. Angels: First 10,000 fans receive an Alex Bregman “Walk-Off Hit” bobblehead. Sept. 15 vs. Arizona: First 10,000 fans receive a Carlos Correa replica orange jersey. Sept. 23 vs. Angels: First 10,000 fans receive a 2018 Astros team photo/2019 Astros schedule poster. Who Can Enter: This Houston Astros Ring Giveaway is open only to legal residents of the United States. When To Enter: The Houston Astros Replica Ring Giveaway begins on April 16, 2018 and ends on September 23, 2018. Sponsor: The giveaway is sponsored by Houston Astros & Coca Cola.